Barbados has excellent wreck & reef dive sites, and there are many well-trained, experienced and professional dive shops to lead you to them. Specializing in semi-private and small group dives, Eco Dive Barbados is dedicated to providing each client with a personalized diving experience. Dive 130ft underwater without getting wet! See breathtaking marine life and maybe even a sunken shipwreck from the air-conditioned comfort of a real submarine! Discover sunken treasures underwater while diving in Barbados' crystal clear waters! 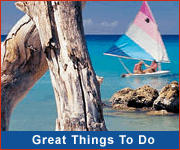 Offers a variety of courses and dive packages, with special scuba diving instruction for kids! Ideally located a stone’s throw from the Carlisle Bay Marine Park, The Dive Shop Ltd. offers great diving adventures for any level - from beginners to seasoned professionals. Not ready to take the full plunge? Not to worry, you too can enjoy the beauty of underwater Barbados as you snokel over shallow reefs and swim with sea turtles. Plan your snorkel adventure. 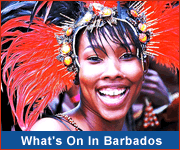 Unlike many of the islands in the Caribbean which are of volcanic origin, Barbados was formed primarily from coral. Diving conditions, including visibility, are good year-round. The average water temperature is mid 80Fs in summer (mid-Apr to Nov) and high 70Fs in winter (Dec to mid-April). Barbados is an excellent destination for divers of all levels - beginners learning to dive, those looking to get some scuba experience, and seasoned divers. Most dive shops in Barbados offer a full range of PADI certified courses for any skill level. And even the most experienced divers will benefit from teaming up with a local dive shop to locate the best sites & get insider tips!